Hi buddies. 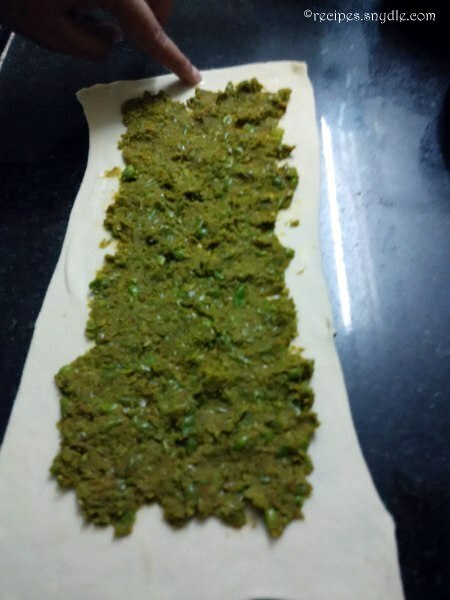 Today I am sharing the recipe of Mutter Vadi. It is a snack recipe, easy to make and oh so delicious! Mutter vadis are like pinwheels stuffed with the grean peas filling. 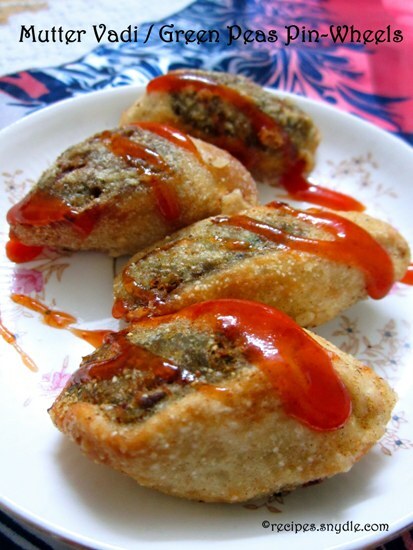 The outer shell is crispy and the filling is moist and flavorful. 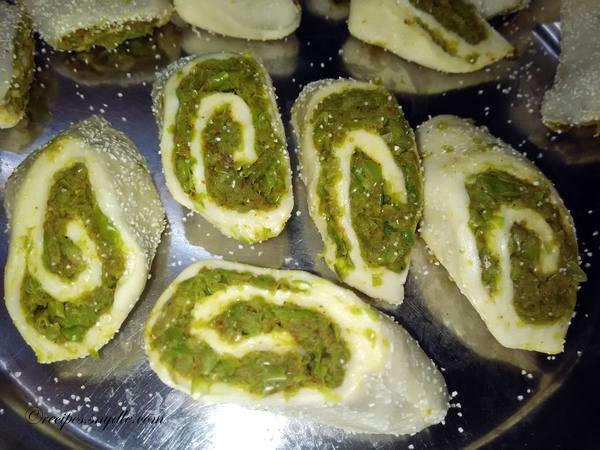 I got the idea of making mutter vadis from the traditional Maharashtrian snack, bhakarwadi. I have also tried making aloo wadis, which has the filling of savory potatoes, the recipe of which will be shared soon. 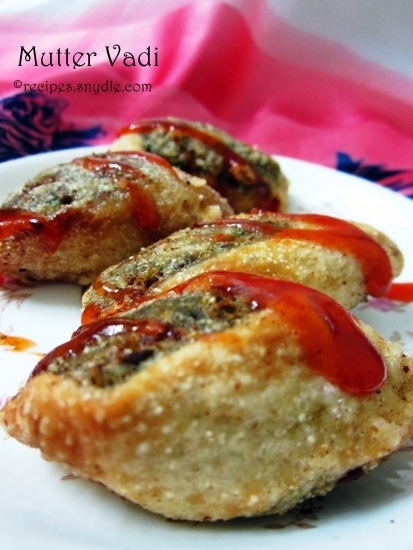 Mutter vadis / Green peas pinwheel are a great accompaniment for your evening tea. 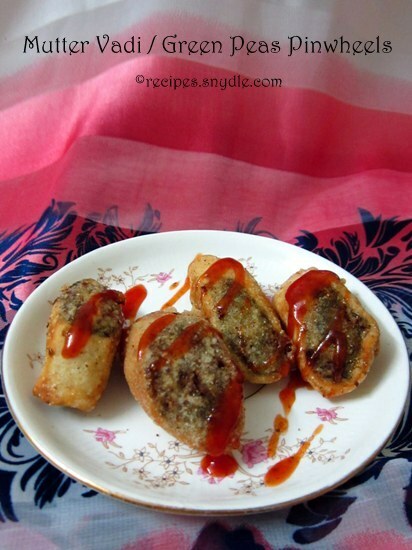 Try this recipe and I am sure you will love this variation. Mutter vadis taste gorgeous the next day as the flavors set in, in the meanwhile. Mutter vadis stay good for 1 day. I store them in airtight container in the fridge since the filling is moist. When you have to serve, just take them out of the fridge and allow them to come to the room temperature. You can even microwave them if you like them warm or hot. Now let’s start with the recipe. For the purpose of measurement, 1 cup = 250 ml. Using rawa / semolina for dusting the rolling surface will enhance the texture of the vadis’ covering, causing it to become crispy. I rolled out the dough without using any maida / flour for dusting. Just the semolina was enough. 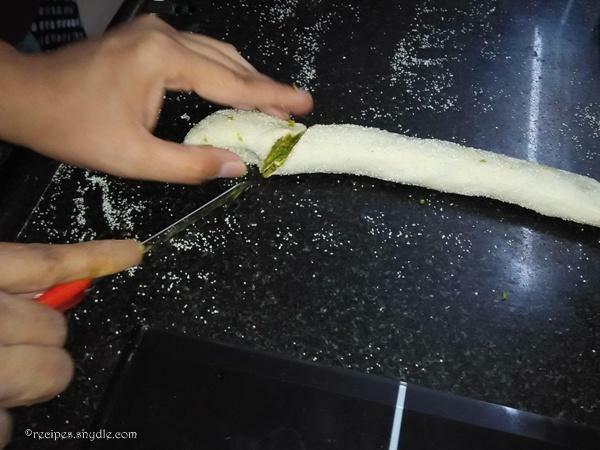 However, if your dough sticks to the rolling surface, you may use the dry maida / flour for dusting. Try not to use a lot of dry flour or the oil will blacken when you fry the vadis. In a bowl, sift together the all purpose flour / maida and besan / gram flour. Add salt and oil to it and mix it around with your finger tips. Add water to the flour mixture little by little as you knead the dough. 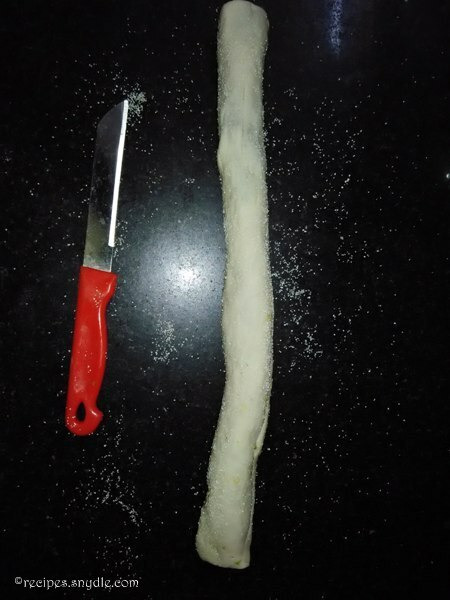 The dough should not be stick. It should be soft and pliable. Cover the dough with a damp cloth and let it rest for 20 minutes. In the meanwhile, prepare the stuffing. Crush the garlic and green chilies very finely using a mortar and pestle. Alternatively, you can pulse them in the mixie. Take a large pot and fill it with sufficient water and bring it to the boil. Add in the green peas and allow them to boil for 7 to 8 minutes if you are using frozen peas. It might take 10 to 12 minutes for fresh green peas to soften up. Drain the peas and allow them to cool down. Pulse the peas in the mixie or food processor till they form a lumpy and granular mixture. We do not want to turn the peas into a very smooth mixture. Take the ground peas into a bowl and add to it the salt, red chili powder, turmeric powder, dried mango powder / amchur and jeera powder / roasted cumin powder. Also, add in the crushed garlic and green chilies. Mix everything well with a light hand. Now rub some oil on the palms and take the dough. Give it a final knead for 1 minute. Divide the dough into 6 equal portions. Take a portion and make a ball of it. 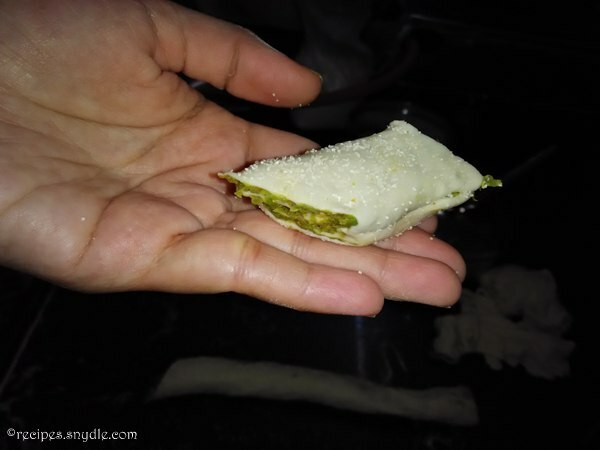 Sprinkle some semolina / rawa onto the rolling surface and roll the ball out with a light hand using the rolling pin. Cut the sides of the rolled out circle with a knife to make a rectangle of it as shown in the picture. 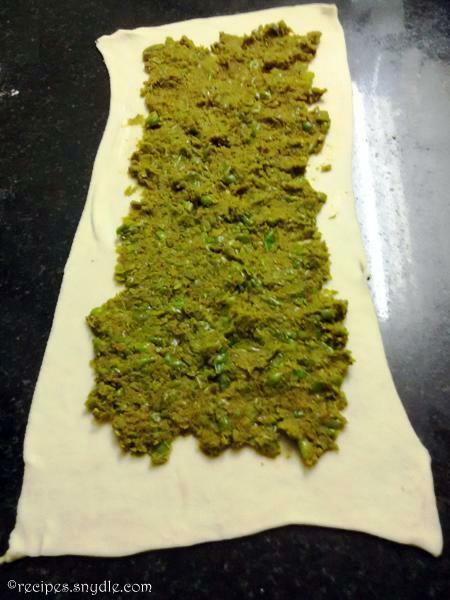 Leave a half inch gap from the edges and spread out the green peas mixture onto the rolled out dough sheet. Apply some water on the edges of the sheet. Roll it to form a flute as shown in the picture. Cut the flute into medium bite-size pieces at an angle of approx 45 degrees. Keep the pieces onto a plate. Repeat the procedure with the remaining dough and filling. Prepare a steamer and steam the mutter vadis for about 20 minutes. In the meanwhile, heat sufficient oil for frying. When the vadis are steamed, remove them from the steamer. Fry them in hot oil on low to medium flame till the outer coating becomes golden brown and crispy. This will take about 5 minutes. Remove the mutter vadis onto the kitchen towel to drain the excess oil. Allow the mutter vadis to cool a bit. Serve them warm or cold. Cold vadis have a crispy texture, which is more desirable. The vadis taste best as the next day. Serve as it is or with ketchup or mint chutney. Enjoy the mutter vadis with your hot cup of tea!